After awhile, well 5 years later anyway, I suppose you get used to hearing sounds at all hours of the night. Especially when you know the banjar is gearing up for the final hurrah. As in last last, very very last rites, of cremation. Hurrah, because well, off they go, the still earth-bound souls of the departed: their ashes, long waiting to be scattered among the gods of the sea. I begin to understand in ways that I haven’t quite yet before, why, after their deceased loved ones died and were buried up to 5 years ago, they would now be marking these weeks with a nearly visible sense of relief and joy. Finally, the essence of bapak or ibu can be released, liberated from all remnants of the physical body, and drift away, merging once again with the elements. Or, better yet, reincarnated in the next generation. But back to the nocturnal sounds. In the dead of night, the music swells, the chanting and reading cut through the night , the gamelan, priest’s blessings, some honking and barking round out the festive air. Over the past couple of nights, I welcomed those sonorous bits, partly because it’s part of local life; but I also knew they were expected and signaled the coming of the end. Not as in armageddon, but a different kind of finality. But just after 4:30 this morning, I awoke to the sounds yet again, threw on a sarong and light sweater and left m y house with camera in hand. 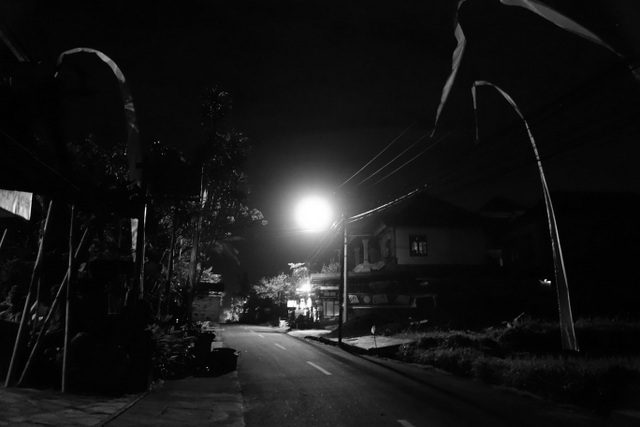 I suspected that, despite the darkness that still envelops us at 5 o’clock, they’d be out in full force, cars, bikes, crying babies, dogs and light-wand-bearing pecalang (village security). I could hear the commotion up the road, cars filling up and idling, bikes revving and motors rumbling, dogs squealing, voices wafting through the air via walkie-talkies everywhere. Then they left. One a time. Then in larger numbers. A caravan of cars. Four-wheel drives. Motorbikes – with women’s colorful kebayas painting ribbons of color across my lens. And a van. What, a van? That was a first, in my experience anyway. Far from a traditional mode of transport. So I waited for what I longed most to see: a truck, the kind typically used to transport black lava rock and sand from Mount Agung to construction sites around the island. But they do double-duty, swinging into action to pick up and bus thousands of Balinese worshipers to villages, temples, beaches and sites far from their homes. The locals, dressed to the nines in their finest baju adat (temple clothes) think nothing of clambering up onto these open-air trucks, traveling for hours at a time, at all hours of the night or in the blazing heat of the day, with nary a complaint. They stand tightly packed, some peering over the edges, others being held up by the crush of passengers. It’s a sight to behold. With smiles to boot. But, after I spotted all the cars, bikes and (what?) the van, I assumed that no truck was in the offing. It had appeared that my banjar had joined the ranks of others in Ubud, and done away with trucks as a means of transport (perhaps also to avert subjecting villagers to the high chance of impending rain). When it seemed as if all the vehicles had already passed my lane, I turned to go. Then, in my peripheral vision, even before I had a chance to register the roar of a larger engine, I caught sight of the open-backed, many-wheeled beast. Ahh, the truck! There they were, some of my neighbors jostling about and laughing in the back – all clearly visible thanks to the headlights of cars following behind. Drats. I missed the shot. And only one truck there was. But oh what a sight. I can’t kick the habit of loving these scenes, even if it means waking before 5 am; watching a community band together, under some of the most strenuous or exhausting circumstances (at least to our Western minds and habits), and seeing how they just go with the flow. Even if the reason for all this pre-dawn activity, as raucous and hilarious as it might seem to be, is a final send-off for the dead.